When I was about six years old, we moved to Crescent Drive North when my father Albert (John to most people except family), joined our new neighbour Cyril Kitson as a business partner at Warren Fruiterers and Fisheries along Warren Road, now a carpet shop. Two others, Ivy Bradshaw, wife of coach driver Jim, and Eva (Powell?) also worked at the shop. Cyril’s father, Samuel Kitson, lived in a little bungalow with a dog called Prince at the top of Crescent Drive North. There were several other traditional shops of that era along Warren Road (electrical, grocer, butcher, baker, chemist and my favourite, the toy shop). From a young boy’s perspective shopping was also a daily social activity where our parents (mums mainly) would have the opportunity to chat with other customers while queuing at each shop. Cyril Kitson’s son, Alan, became my best friend for many years and, like many others of that time, we enjoyed the freedom of the Downs and local open spaces. Particular favourites were the dewponds and dumps plus various barns and during construction of the North Woodingdean estate there were always houses under construction to explore when the builders were absent. Alan and I went to different primary schools (Woodingdean and Rottingdean) and cub packs (23rd and 49th Brighton) respectively so also had additional friends from there. I remember from my childhood in the 1960s two particular shops in this photo. The TV/Radio shop was owned by my uncle Dennis Mann and later run by his son Peter Mann. Next door was the butchers shop owned by another uncle, Tom Price. Both their families lived above the shops and my sister Janet and I often caught the bus from Hove Town Hall to travel to Woodingdean to play with our cousins in their back gardens. As my dear old dad used to say, “Happy Days”. Like Nick, I saw these shops many times in the 1960s, as I passed them on my way to visit my aunt, uncle and cousin in Downs Valley Road every week. At first I went by bus from The Level and up Bear Road, then by bike via Elm Grove, and finally on my Lambretta. At the far end of the shops, a mongrel dog used to lie in wait for my motor scooter on the return journey, and then rush out as I rode along towards the Race Hill. He would chase me along Warren Road for about a hundred yards each time, snapping and snarling at my right ankle. It was a miracle he didn’t disappear under the wheels of my scooter. I remember Mann’s! My father, not someone who naturally trusted shopkeepers had great faith in Mr Mann. We lived at 26 Crescent Drive South. I attended Woodingdean County Primary School 1955-57 (Mr Betts and finally the delectable Miss Rice), then Brighton Hove & Sussex Grammar School for Boys. I left for university in 1964 and did not return to Brighton until 2012 when, on retirement, my wife and I settled in Hove. Both I and my family were very happy in Woodingdean. 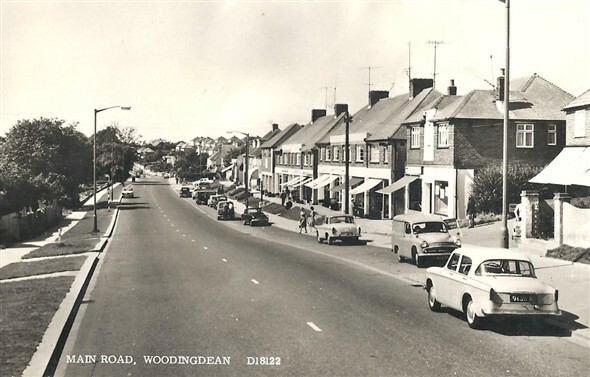 I was born in Woodingdean and went to Woodingdean Primary and Longhill Secondary Modern (as it was back the day) and have very fond memories from my childhood, the rocket park at the top of Balsdean Road being one of them. While visiting a friend in Woodingdean last week, we were trying to name all the shops that were around in the ’60s. I managed to name them all except one which is the last one on the row of the shops in the picture – would have been the first one after Ghazells. Anyone recall what it was in the 1960s ? Those were the days when, yes, you were packed of for the day with some pop and sandwiches and maybe an apple to wander over the Downs or catch the number 2 bus down to the pool in Rottingdean. We were so lucky to have such freedom to enjoy the simple things in life. Apart from Major Haggard, of course, I can only really remember the teachers who taught me at Woodingdean School, Mr Bentham, Mr Betts and Mr Collins, who between them must have done enough to get me to grammar school, Westlain, because I wasn’t very academic at that time. The winter of 1962/3 stands out as an exciting time as Woodingdean was cut off for some days causing us to have to walk to Rottingdean over half buried cars to fetch milk and other provisions. Maybe time fogs the memories but winters did feel like winters with lots of frost and snow and summers felt like summers, long warm evenings spent outside playing or as a treat taken down to the beach for an evening dip.